are the birds I once had. 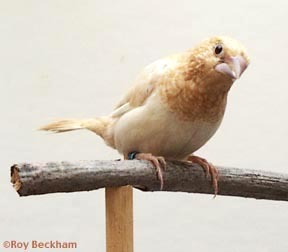 The Society Finch is one of the oldest and most loved finches kept by fanciers today. His cheerful personality and beautiful colours are only some of the reasons why so many love this wonderful breed. 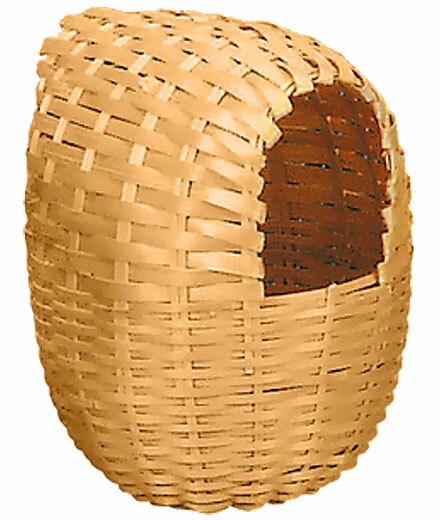 Its sweet nature and good temperament makes it an ideal addition to any aviary or bird room. 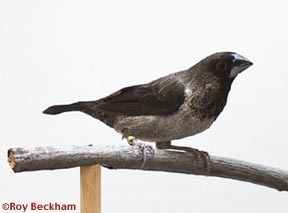 The Society Finch is well named, as he is a social and friendly bird. They take great love in living in groups and will often be seen huddling together for sleep and preening each other. They are also curious and playful birds making them wonderful pets. In addition they are neither too noisy nor overly active. 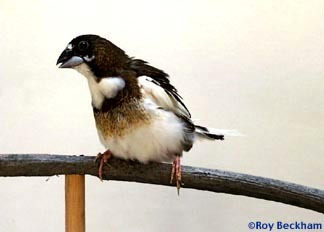 Unlike other breeds of finch the Society Finch only exists in captivity. It has never existed in the wild; rather they are the product of careful breeding by man through the centuries. Because they have had such a long history with humans they are not as easily stressed as other Finch varieties, and for this reason make a better choice for novices. The males of this species sing a lovely song, a boisterously loud, he will puff out his feathers and stand tall while he quickly hops from side to side singing. They will sing to hens and other males. The females are usually limited to chirping or making clicking or warning sounds. In rare instances singing is seen in females but this is not the norm and should not be expected. Some claim to be able to distinguish males from females by the differences in the head and beak regions. The method of sexing is to compare both the head width [in a line across the top of the head between the eyes], and the shape of the under-side of the beak. The male has a much broader head than the female; and the male's under-beak [where the beak meets the feathers of the neck] is a "V' shape and the hen's more rounded like the bottom of the letter "U". In both these methods the two birds should be held side by side to compare. 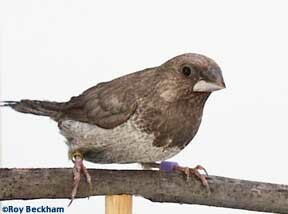 Society Finches are also very popular amongst breeders because they are excellent foster parents and are known for being very eager breeders. Especially with delicate finches such as the Gouldian these finches are usually used to incubate the eggs of these more delicate birds. Most males will accept new eggs and even some babies without hesitation. 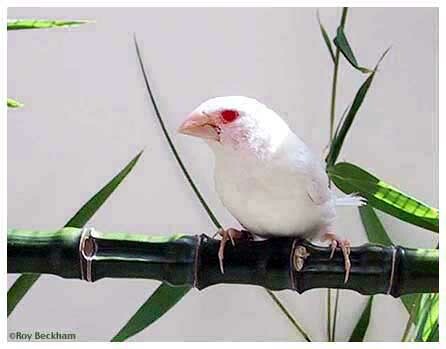 Because the Society Finch has been bred and kept world wide for centuries there are differences in the appearances of the European, American and Asian varieties. Much of the differences are due to breeders taking interest in different areas. The Japanese specialize in frilled varieties, while the European Varieties display larger size and scaled bellies. 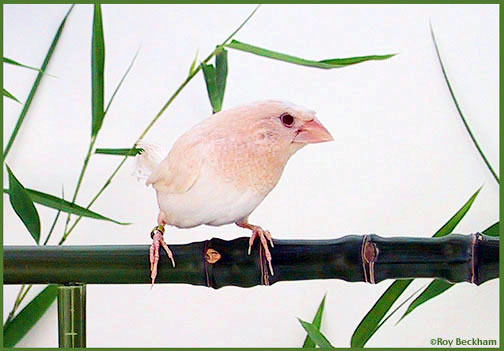 The first Society Finches were bred in the Orient, probably Japan. 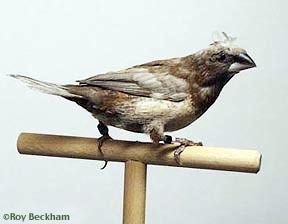 Originating in China the Society Finch is one of the oldest breeds of finch. Carlos Linneas first named them in 1766. Their captivity date back so long ago, that their true ancestry or beginnings have always been controversial. 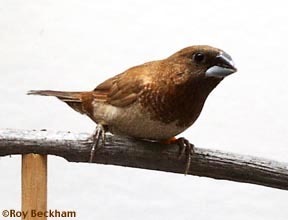 The history of the Society Finch seems to be the subject of some debate. The fact that it is an entirely man-made finch created through generations of selective breeding is not a subject for debate. 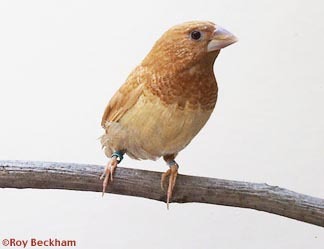 Nor are its relation to other manikins such as the various Asian and Indonesian munia species and the Spice Finch. But its relation to some other species is debated and not known with certainty. 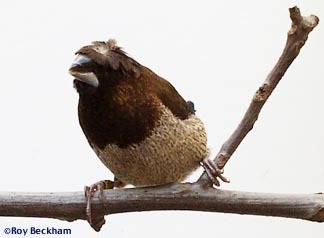 There also seems to be some debate over the scientific name of this finch. Some classify it as Lonchura striata and others classify it as Lonchura domestica. There are a few mutations and colors. Dominant pieds that are mostly white, all white birds, true albinos, a dilute called creamino and there is a trend in Europe to hybridize the Society with other Lonchura to introduce different colors. The Black Browns are an example of their efforts. There are also a number of feather mutations like crests. There are numerous frills that cover nearly every part of the body, including things like chest frills that cause the feathers on the breast to point out or upwards. While combinations of the color modifier mutations (Gray, Pearl, Dilute and Ino) are possible with any of the base colors (Chocolate, Chestnut and Fawn), the base colors cannot be combined except in purely random occurrences. 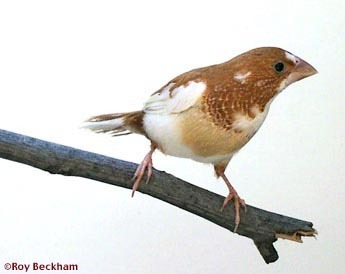 Some birds showing Chocolate, Fawn and White on one bird have been produced and are called Tri-colors (not to be confused with Tricolor nuns) but cannot be reproduced. The Society Finch is accepted in a wide variety of types and colours. Sällskaplighet: Blir vanligen ej tam. Utfodring: Hirskorvar, finkblandning, frukt och grönt, nate (obesprutat), äggskal, äggula, myrägg, snäckskal. Fjäderdräkt: Måsfinkar älskar att bada och gör det gärna alla på en gång. Fjädrarna putsas noga och ligger tätt mot kroppen. Det finns arter med crest (tofs på huvudet), vilket är dominant men inte så vanligt förekommande. Revirinstinkt: Trivs bra i mindre flockar och sover gärna tillsammans i en stor hög. Kan gå ihop med andra finkar, undulater och t.ex. nymfparakiter. Hälsa: Honan kan drabbas av värpnöd. Låt henne vila mellan häckningarna. Uppfödning: Bäst resultat i voljär men även om man sätter ett par i en egen bur. Uppmatning: Allt som föräldrarna äter, gärna lite extra äggula.